Admittedly, my heart was broken when the announcement about shutting down myRA® hit the news. It wasn’t perfect, but it was a way to help people do the very thing financial professionals want people to do more: save for retirement. 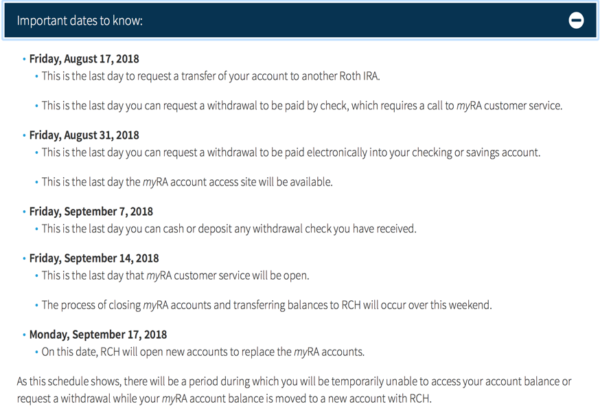 Do you want to continue saving in a Roth account? You contribute to a Roth with after-tax dollars (money on which you have already paid income taxes). This means that the tax advantage of the Roth account is particularly helpful if you need the tax break more in your senior years than you do now. So, first you must decide if a Roth is still the best fit for your needs. There are so many opinions online (I have mine as well), but in order to make this decision, look at the facts before you choose. There is no universal right choice – only the best choice for your circumstances. If you do want to stick with a Roth, you have options! If you have investment accounts in another institution, you can do a “trustee – to – trustee” direct transfer and avoid any fees or penalties. Contact the new institution and they will walk you through the process. The unknown variable here is the fees, so be cautious and ask questions before making any moves. If you move to an new institution, look for providers that have low fees and low minimums to open an account. This may seem like the easy solution, especially if you have looming debt. However, you can lose the benefit of the interest you have gained. While you won’t be penalized for taking out what you put in, you may have penalties if you withdraw the interest you have earned. If you are not yet 59½ and need the funds, you can withdraw your contribution, but there will be fees: a whopping 10% early withdrawal penalty. You may be able to avoid the fees if you use the money for certain financial goals or situations, such as purchasing your first home, paying college costs, medical bills, or purchasing health insurance after losing your job. The myRA deadlines may provide some insight. If you want to transfer to another Roth, do your research and learn a bit about investing before you take action. Check out these deadlines and consider the timing. Whatever you decide, be wary of anyone trying to sell you something. You should not need to incur fees for this transfer. If you aren’t sure about what to do, allowing the US Treasury to place your money in a low-risk account with no management fee may be your best option. To talk with someone (an actual human) before making this decision, find a financial coach or counselor who can help you consider your options with you specific circumstances in mind.